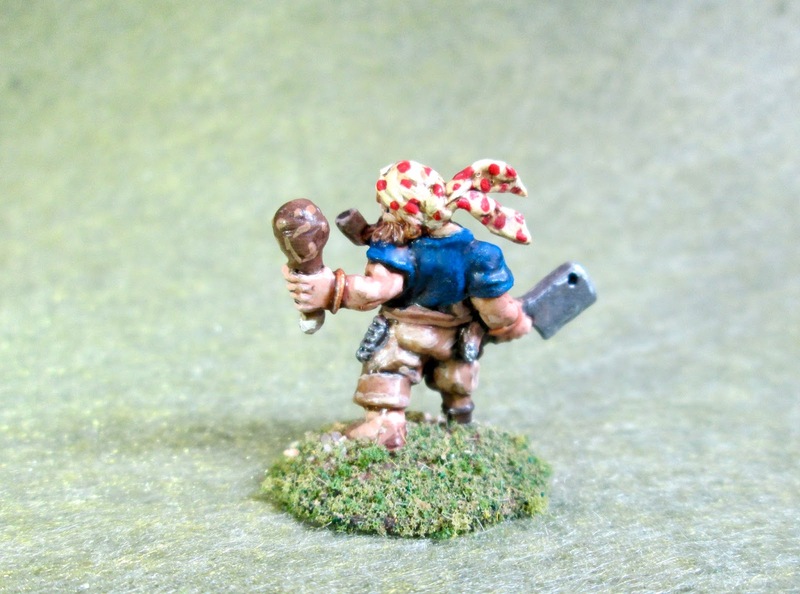 Gruff Grimecleaver, Dwarf Pirate Conversion | H.A.W.K.S. Anyway, first thing I needed to do was make him a little more pre-gunpowder in his technology level; so that mean I had to remove the gun. 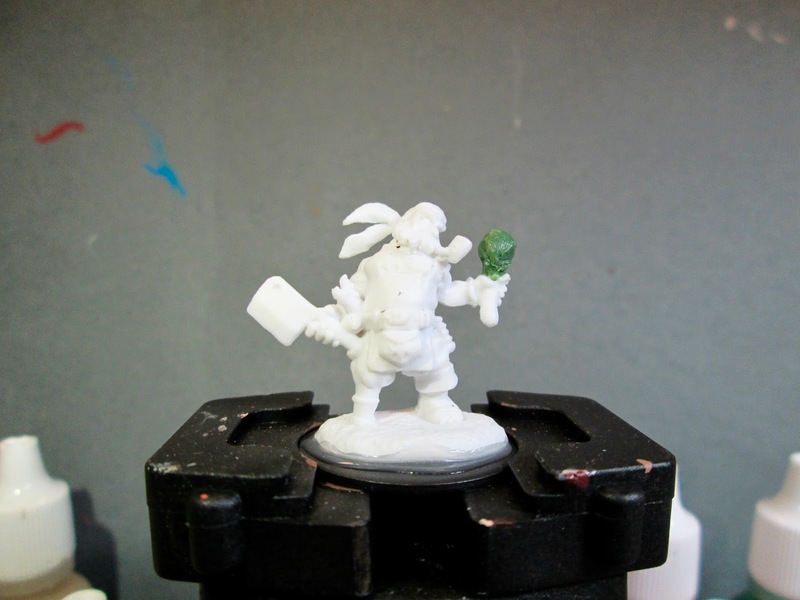 I decided since Halflings and Dwarves are both notorious eaters, the simplest thing I could do with the gun was to convert it into a drumstick by using a little greenstuff. I also, trimmed his large mustache way back, since I don’t think Halflings are quite as known for large facial hair as dwarves are. I also tried to trim his boot a little to make it look more like a sandal with bare toes sticking out. (Assuming he would still have a little of the Halfling urge to have his feet free to the open air. Of course, before I did any of the conversion work, I prepped the figure in the usual way; soaking it in a dish of water with a couple drops of dish-soap added, then I gave it a light scrub with a soft toothbrush, and then rinsed and dried it. 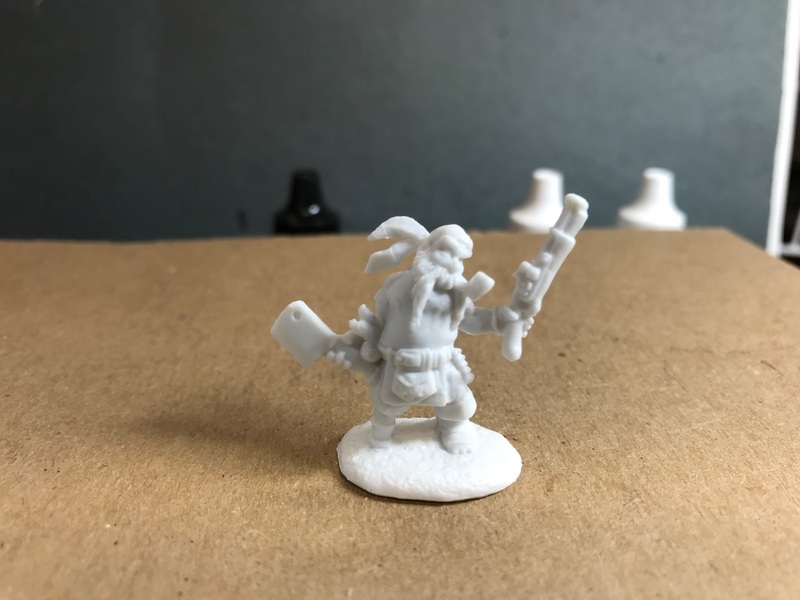 Then, after the converting was done, I glued the figure to a black-primed 1" fender washer with Aleene’s Tacky glue, and when dry, put it into my Citadel painting grip. I began by painting his head, arms, and leg with Reaper MSP “Tanned Skin”. 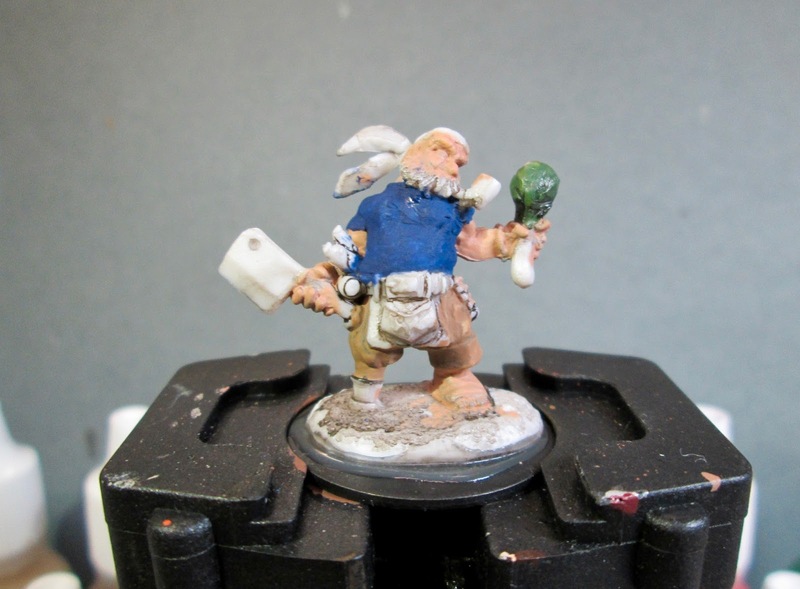 I then painted his shirt with Crafter’s Acrylic “Navy Blue”, and his pants with Ceramcoat “Territorial Beige”. “Neutral Grey”, and then did his belts and pouch with Nicole’s “Brown”. 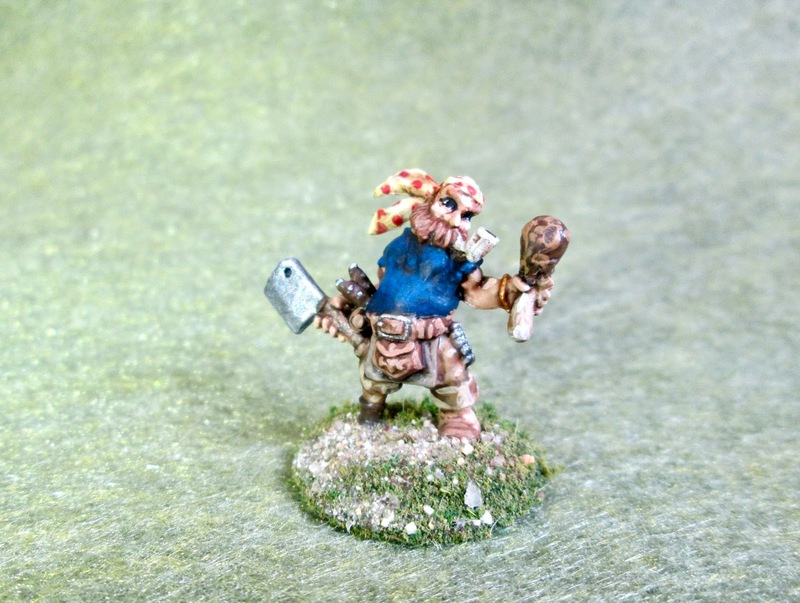 After that, I painted his sandal with Folk Art “Teddy Bear Brown”, and then did his wooden leg and cleaver handle with Americana “Asphaltum”. I also did his pipe using Americana “Dove Grey”. I then painted polka dots on his bandana with “Deep Tomato Red”, and then painted his knife handles and spice pouch with Americana “Raw Umber. Next, I painted the top of the drumstick with Reaper MSP "Turkey Brown”, and the bone part with Americana “Bleached Sand”. After that, I painted the cleaver blade, belt buckle, sharpener(?) hanging from his belt, and knife hardware with Americana “Zinc”; and also painted his wristband and bracelet withAmericana “Terra Cotta”. I let everything dry for a while, and then I gave the entire figure a wash with Citadel “Agrax Earthshade” wash. 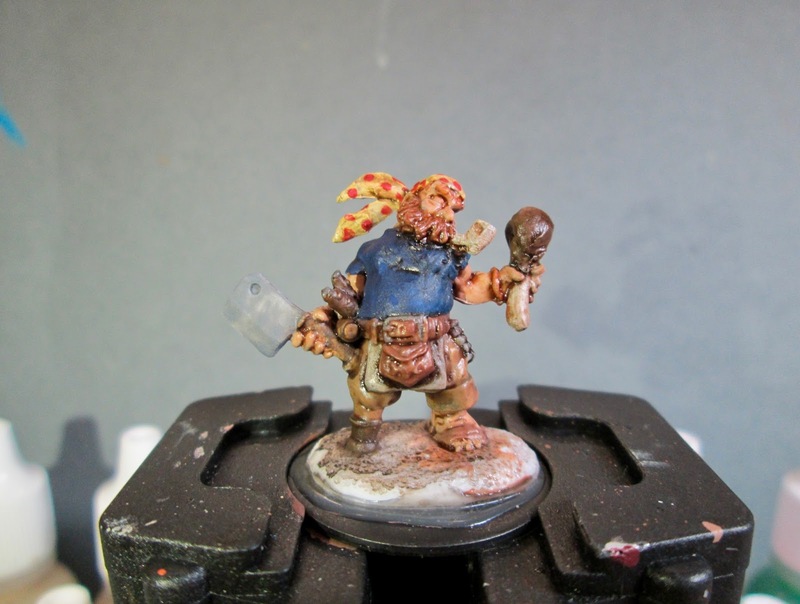 When the wash was dry, I painted his eyes, and then highlighted his skin with Reaper MSP “Tanned Highlight”. 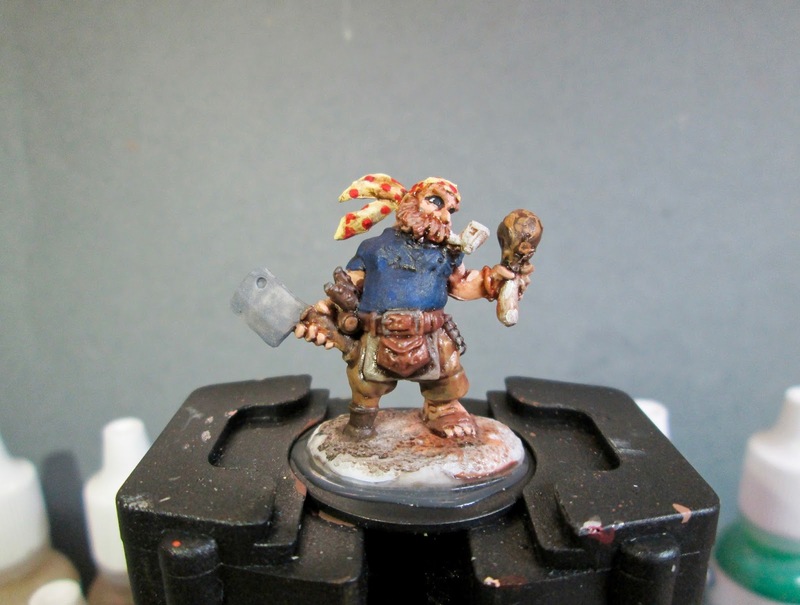 I then highlighted his beard and hair with Americana “Sable Brown”, then highlighted his bandana with Apple Barrel “Apple Parchment”. After that, I added a little highlight to the dots on the bandana with Reaper MSP “Holly Berry”. I then highlighted the pipe with the base “Dove Grey”, and highlighted the top of the drumstick with Accent “Mustard Seed”, and the bone with the base “Bleached Sand”. Next, I highlighted his shirt with Americana “True Blue”, and highlighted his pants with Folk Art “Butter Pecan”. I then highlighted his apron with the base “Neutral Grey”, and his belt, pouch and sandal with the"Teddy Bear Brown". I highlighted the axe handle with Americana “Mississippi Mud”. 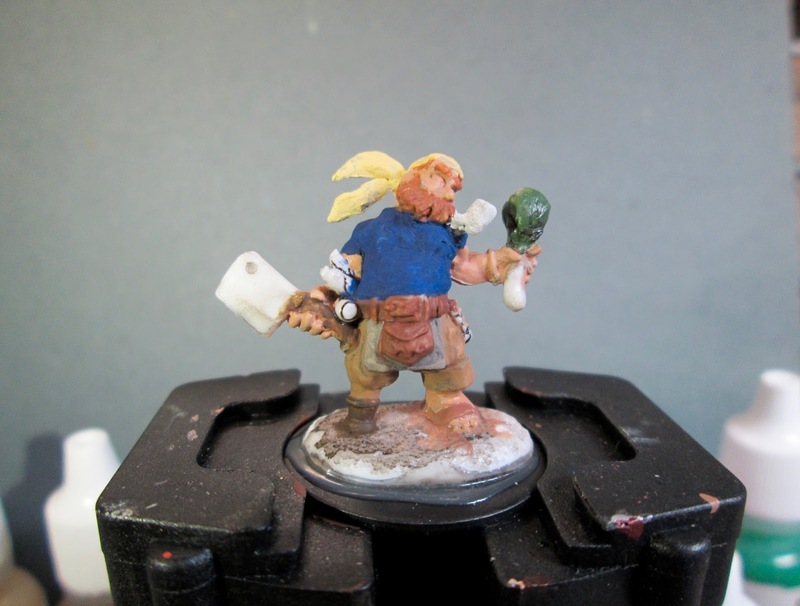 I then painted the axe, belt buckle, knife fittings and knife sharpener(?) hanging from his belt all with “Gunmetal Grey”, and when dry, highlighted those pieces with Ceramcoat “Metallic Silver”. Another cool one. Really like the spotted bandana, nice touch!